Goodgame Studios has developed tremendously in many different areas over the last few years. Not that long ago, everyone sat together in the same room, and an artist for Goodgame Poker could shake the hand of their marketing colleague without even leaving their seat. Now we work across two different sites in Hamburg, separated into seven different studios, with a whole marketing department of our own and lots of other teams who all work hard to make our games successful. Nonetheless, we continue to collaborate very closely because we know that a game can only become really good when it’s created as a joint venture. To keep our collaboration running smoothly despite the constant change in the company, in 2014 our staff development team created the Goodgame Academy to help us develop our soft skills. 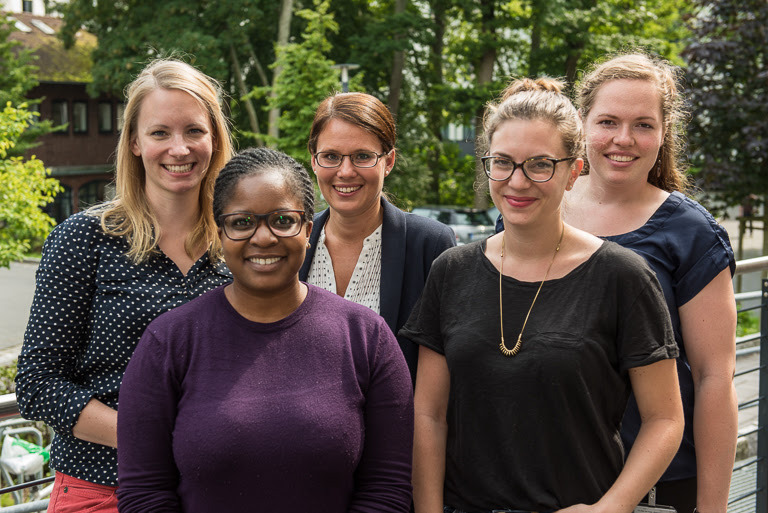 The driving force behind Goodgame Academy are Katharina, Nana, Christine, Madeleine, and Anika (from left to right). Since the start of this internal training program, they have continued to develop the courses and better adapt them to the needs of our colleagues. Last year, 330 Goodgamers took part in a total of 39 training sessions at the academy! Four courses are currently being offered: Communication, Time and Self Management, Self-Awareness, and Conflict Management. I’ve already attended the course “Success factor:Self-Awareness” myself – purely for research purposes, of course. Without giving away too much, there’s no hiding at the back of the room here – everyone is challenged! Even if some of the activities were a bit nerve-racking, they were also a lot of fun. They were also very educational because what we heard from the group often didn’t reflect our own self-perception and was usually much more positive than expected. Everyone has something to work on, of course, and the trainers’ personal tips were very helpful for this. The course’s goals are to develop an awareness of your own body language, to improve your diction (such as with the help of a cork exercise), and to practice exhibiting confidence and breaking down insecurities. Even though a workshop like this only takes half a day, it’s nonetheless very effective since it inspires the participants to continue working on their own soft skills and gives them the appropriate tools to do so. The other Goodgame Academy courses also consist of a combination of input and interaction. The theoretical content is treated in such a way that it’s easy to comprehend and put into practice. That’s why a lot of new things are tried out in the group. “It’s very important for the transfer benefit,” revealed Katharina, who teaches most of the workshops together with Anika. “Our primary goal is to inspire participants to leave the course feeling motivated and work on themselves more intensively over the following weeks,” she explained. The course “Success factor: Time and Self Management” therefore has a follow-up session 6 weeks after the course with a partner exercise. “A major advantage of the academy is that everything takes place internally and we develop the concepts ourselves. Since we’re also Goodgamers, we know the company and its needs very well and can therefore provide training in whatever issue is currently the highest in demand. For example, we’re currently working on topics like our mistake culture and creativity techniques. We’re also planning new micro training sessions that should only take 2 hours. This is a really big challenge, but it can also be very rewarding, especially if we’re working on a special topic that is in high demand for the near future,” said Katharina. The positive feedback from the participants confirms that the team is doing a good job. “My personal highlight was when a Goodgamer said that now you can tell who in a meeting has visited our communication course and who hasn’t, and that now discussions run much better than before,” reported Katharina. In addition to Goodgame Academy, the staff development team offers other training opportunities that promote the technical skills of Goodgamers. Courses on web application security or SQL, for example, are offered by external experts, and the same applies to language courses. The staff development team doesn’t want to get the short end of the stick, of course – so the entire team seizes every opportunity to learn new methods.